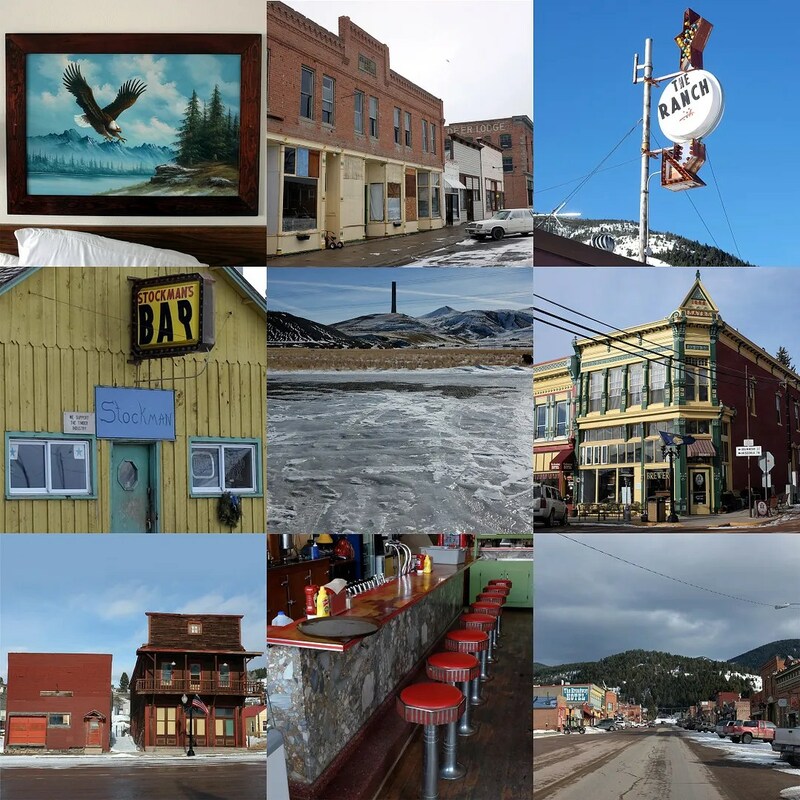 This weekend, Alex had a commission to do some photography back in Anaconda and some thesis photography work that took us to Deer Lodge and Philipsburg. 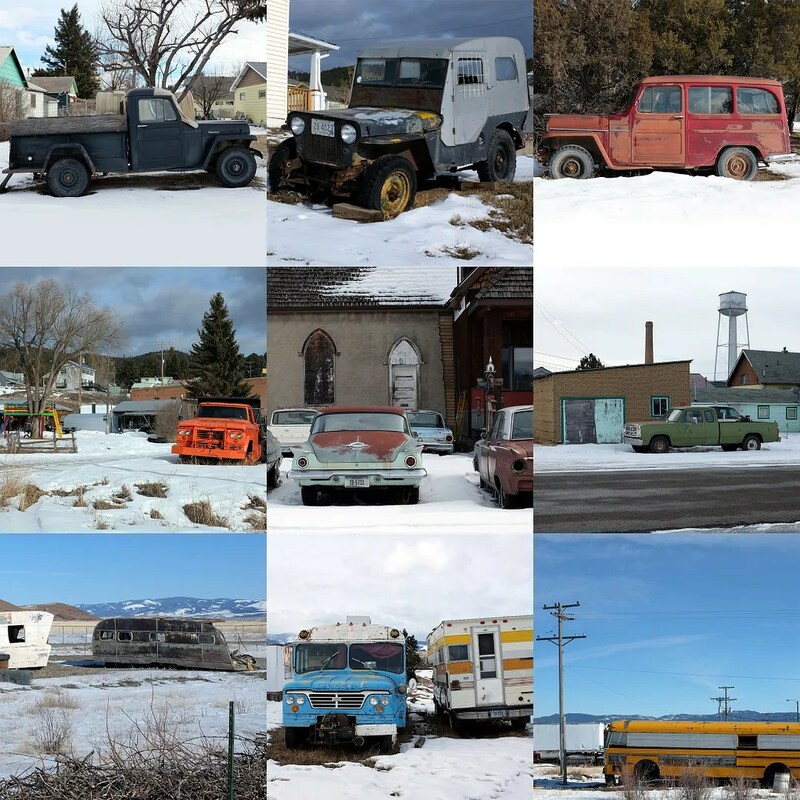 With snow in the forecast for Saturday, we drove out Friday night, after a stop at an antique fair in Bozeman. 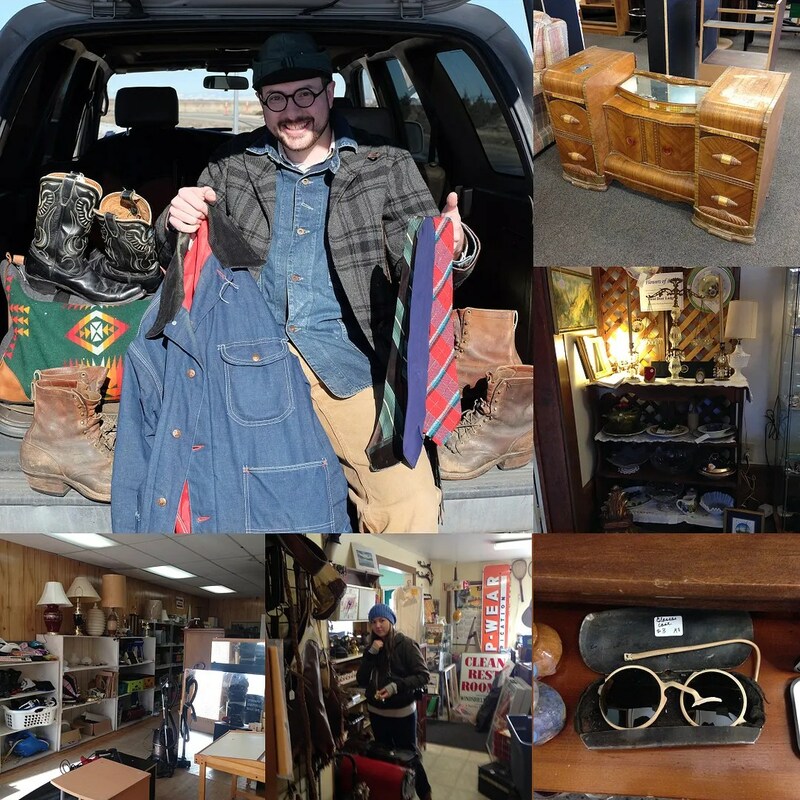 I got my shop talk and dealer gossip in with Tamara of Mountain West Mercantile (Livingston, MT) and Brian of Rediscoveries Vintage Clothing (Butte) and found a couple interesting bits of vintage. Then off to Deer Lodge, a little over 120 miles away. Deer Lodge was founded in 1864, around the Grant-Kohrs Ranch. The Montana State Prison was built in Deer Lodge in 1871 and operated through to 1979, when it was replaced with a new facility outside town, currently the major employer of the area. Deer Lodge was a major railroad town in Montana before being bypassed in 1980. Railroad hotels built in the early decades of the 20th century sit abandoned, The Montana’s ground floor businesses having survived into the early 1980s, while The Deer Lodge was abandoned after a boiler failure in the 1960s. The historic prison is now a museum, comparable to Alcatraz, only without any other people to spoil the creepiness of the experience. An annex to the prison houses a car museum, and buildings across the street are used as an old west museum, toy museum, pen museum, and a local history museum. This is well into the off season. Downtown is more dominated by pawn shops, casinos and bars this time of year. We woke up to whiteout conditions out our window at the Western Big Sky Inn. Lucky for us, it was more wind than snow and the roads were more or less clear by 10. It hasn’t been that long since we were in Deer Lodge, but two of my “go-to” stops have disappeared, an antique shop in an A-Frame on the edge of town and a thrift/junk/antique store right downtown. The antique store by the prison didn’t seem to have any new stock since my last pass through over the summer and the thrift shop had almost no men’s section. We drove around town taking pictures, through the residential areas, with their one bedroom company houses, through the industrial areas (there is still one large lumber mill just outside town) and through the back alleys of the main drag. It’s always fascinating to see how these towns have changed. How the ground floor of a building was redone in the ’60s, and now bears a sign from the ’80s, but the upper floors are untouched. How the facade of a building may stand, but the building behind is a pre-fab metal shed, erected after a fire claimed the original structure. While taking pictures of one of the abandoned railroad hotels, the owner of a secondhand shop down the street poked her head out and started watching us. In typical Montana fashion, instead of “hey what are you doing, get out of here!”, we were met with the full history of the place, which she now owns and has been working on fixing up when time and money allow, and of the town, with some recommendations on hidden spots for us to shoot. Then on to Philipsburg (founded 1867), a former mining town which went bust following the closure of mines and sawmills in the 1890s. Starting in the 1990s, the town began to be restored and geared to tourists. It’s a beautiful town, very much in-tact, but with a fakeness stemming from the restoration. The most compelling buildings were the ones on the fringes, still abandoned, still bearing faded signage from the 1920s in the windows. The 1990s does 1890s signage hanging from all the businesses (candy stores, gift shops, breweries, jewelry stores) and the restorations deny the century in between, the rise and slow decay which makes all these western towns so interesting. It’s nice to see a town in this area having found a way to drag itself out of the ashes, but it’s strange to walk down a main street filled with things which are so real yet feel so fake. We had a great lunch at the local soda fountain, a drug store from the late 1800s with a beautifully preserved 1930s Liquid Carbonic Corporation soda fountain and 1990s-does 1950s retrofication. The thrift shop was a gold mine, and we found a cache of vintage hardware at the antique shop for the bus interior. We drove Alex’s ’96 4 Runner on this trip and kept getting stuck in snow or sliding backward down hills while exploring the neighborhoods. Scary, but no harm done. Finally, we ended up in Anaconda. We’ve done Anaconda so many times now for Alex’s photo projects that it’s started to feel like home. Like a small town that you’re trying to escape. We were set to meet up with a photo client for a commission of some photos of downtown around noon. It later turned out that his short ski trip scheduled that morning had turned into a 20 mile backcountry trip. So we waited. And we waited. It being Anaconda, there aren’t a lot of businesses. It being Sunday, there weren’t a lot open. It being Super Bowl sunday in a sports town, there was nothing open. We’ve so thoroughly done the town on a half dozen other fine-toothed-comb photo trips that even driving around for hours, we couldn’t find much new to shoot. So we sat in the car downtown waiting for the phone to ring for hours, until the sun started to dip behind the mountains which ring downtown. We eventually got the call, halfway back to Bozeman, and all was resolved. Alex had guessed and taken the shots that were needed in the time we were sitting. I made a good enough haul Friday and Saturday to pull the rest of the trip into the black. 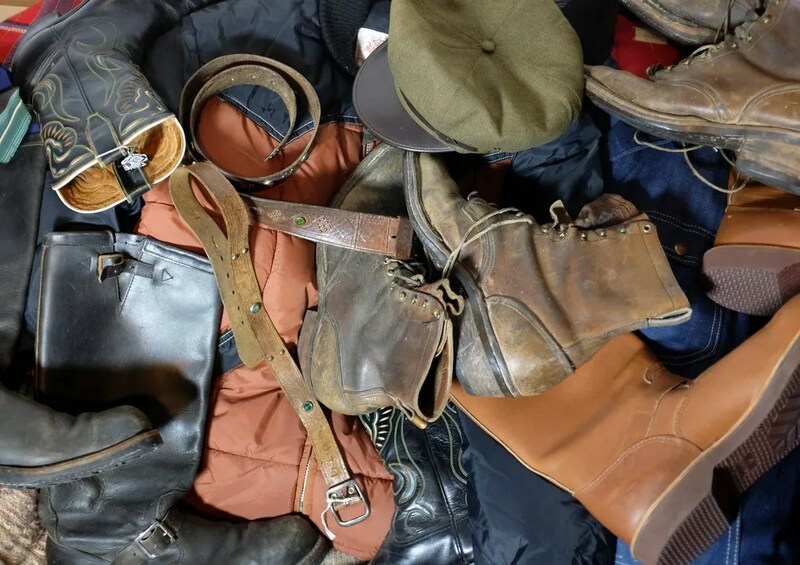 This entry was posted in on the road and tagged abandoned, American Picker, Anaconda, Deer Lodge, Montana, on the road, Philipsburg, vintage, vintage boots, vintage dealer, vintage picking by Spencer Stewart. Bookmark the permalink.